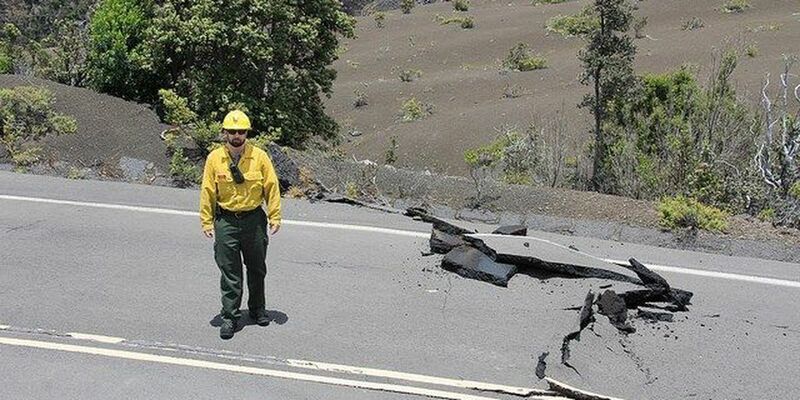 VOLCANO, HAWAII (HawaiiNewsNow) - Ongoing eruptions and earthquakes have damaged a number of areas at Hawaii Volcanoes National Park, which remains closed to visitors. The damage raises questions about how long the park — the Big Island's no. 1 tourist destination — might have to remain shuttered, even after volcanic activity subsides. Park spokeswoman Jessica Ferracane said damage to the park includes a large crack to the outdoor overlook area at the Jaggar Museum. She said the cracking appears to have worsened after Sunday's 5.5-magnitude quake at Kilauea's summit. She said there's also been "significant damage" to the museum, the Hawaiian Volcano Observatory, and the emergency operations center. Corrosive volcanic ash and continuing explosions at Halemaumau Crater are also leaving behind a big mess. Most of the park shut down May 11 amid the threat of explosive eruptions at the summit crater. Those eruptions have been going on for weeks now, sending plumes of ash more than 10,000 feet into the air and expanding the summit's overlook vent from about 12 acres in area to 120. Ferracane said that the ongoing threat posed by the crater is complicating efforts to safely assess damage at the park. The park remains without running water. Layers of acidic volcanic ash coat picnic tables, roads and overlooks. In addition to the cracking at the overlook, large cracks have developed in roadways. Crater Rim Drive and Hilina Pali Road near Kulanaokuaiki Campground are impassable in places. Earth cracks have also been observed near Holei Sea Arch. Park officials say there's no telling when the park will reopen. "We'll only reopen when it is safe to do so, and we will need time to assess, make repairs and clean up," said Park Superintendent Cindy Orlando.